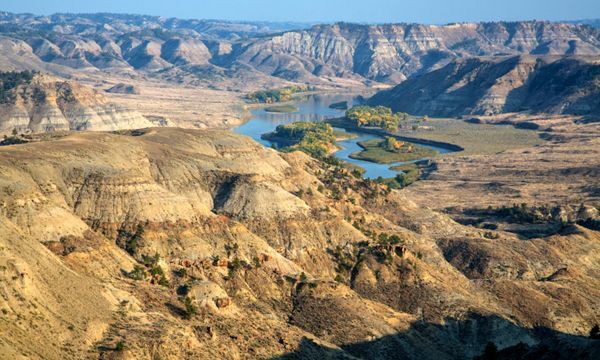 Containing a spectacular array of biological, geological, and historical objects of interest, the Upper Missouri River Break National Monument spans 149 miles of the Upper Missouri River, the adjacent Breaks country, and portions of Arrow Creek, Antelope Creek, and the Judith River. From Fort Benton to the Charles M. Russell National Wildlife Refuge, the monument includes six wilderness study areas, the Cow Creek Area of Critical Environmental Concern, segments of the Lewis and Clark National Historic Trail and the Nez Perce National Historic Trail, the Fort Benton National Historic Landmark, and more. The area was declared a National Monument in January 2001. Though largely unchanged in the more than 200 years since Meriwether Lewis and William Clark traveled through it on their epic journey in 1805, the valley of the Upper Missouri River is a living museum, the product of many events over time. About 90 million years ago, wide oceans, volcanoes, and dinosaurs existed in what is now Montana. Rivers continually carried sediment into the vast interior sea. These sediments of mud and silt were laid down in layers on the ocean floor. Over great periods of time, these sediments were compressed and formed into sedimentary rocks. Next came the glaciers. They pushed south into present-day Montana and forced the Missouri River into a new channel by carving through stone and sediment to re-route the flowing waters. As more time passed, flowing magma from prehistoric volcanoes hardened and formed into igneous rock while uplifts occurred on the ocean floor, causing the interior seaway to drain. These newly exposed landforms have been and still are subjected to rain, snow, wind, ice, and piercing heat. These climatic forces shaped the sedimentary and igneous rocks into extraordinary cliffs, canyons, pillars, and spires near the water’s edge creating the landform known as the Breaks. The black color of old volcanic features contrasts sharply with the lighter colored shale’s and sandstones creating beautiful views along the river. 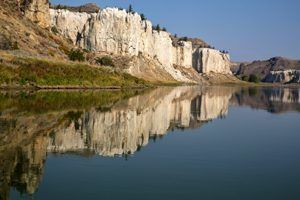 For thousands of years, the Upper Missouri River area provided a home for many Native American tribes such as the Blackfoot, Gros Ventre, Assiniboine, and Crow. Other tribes traveled through and used the area, including the Shoshone, Cheyenne, Sioux, and Nez Perce. The Missouri River landscape, though sparse in appearance, provided many resources the tribes needed for daily living, including numerous types of plant and animal life. These tribes lived by following the tremendous herds of bison as the animals roamed the prairie. Other game species, such as elk and deer, also provided sustenance. Plants along the Missouri River, such as willow and snowberry, provided for and supplemented their nutritional and medicinal needs. These first peoples utilized the Missouri River as a path of trade and transport. In addition, the river and its tributaries formed tribal boundaries. The center of Native American trade along the Missouri River was in the Dakotas region on its great bend. Here, a large cluster of walled Mandan, Hidatsa and Arikara villages situated on bluffs and islands was home to thousands of people and would later serve as a market and trading post used by early French and British explorers and fur traders. The first Europeans encountered the river in the late 17th century, and the region passed through Spanish and French hands before finally becoming part of the United States through the Louisiana Purchase. Following the introduction of horses to Missouri River tribes the natives’ way of life changed dramatically. The use of the horse allowed them to travel greater distances, and thus facilitated hunting, communications, and trade. 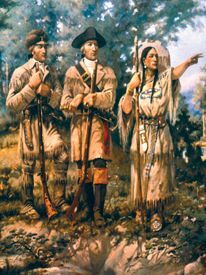 Lewis and Clark with Sacagawea, guiding them. They spent days at the mouth of the Marias River trying to resolve the dilemma of which river to follow. Through exploration, river observations, and the captains’ educational background, Lewis and Clark determined in slightly more than a week which river was the correct one, and therefore, which route to take. They took the southern route. This decision took the explorers in the right direction as they continued on to the Pacific Ocean. During the years following the passage of the Lewis and Clark Expedition, the Blackfoot Indians showed such an uncompromising hatred for Europeans that the tribe effectively prevented the penetration of their territory by trappers. However, the American Fur Company was finally successful in opening the upper river to trade in 1831. In that year they established Fort Piegan at the mouth of the Marias River. The following year they moved eight miles upriver and established Fort McKenzie. 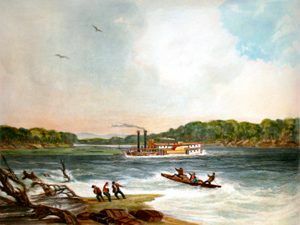 The Missouri River soon became one of the main routes for the westward expansion, with the growth of the fur trade laying much of the groundwork as trappers explored the region and blazed trails. Pioneers headed west en masse beginning in the 1830s, first by covered wagon, then by the growing numbers of steamboats entering service on the river. Former Native American lands in the watershed were taken over by settlers, leading to some of the most longstanding and violent wars against indigenous peoples in American History. A Swiss painter named Karl Bodmer was asked to journey across the American West in 1832 with German Prince Maximilian of Weid. They reached St. Louis, Missouri in March 1833 and traveled into the American frontier on the steamboat Yellowstone, owned by the American Fur Company. In seven weeks they had traveled nearly 1,500 miles and stopped at Fort Pierre in what is now South Dakota. They traveled another 500 miles on the steamboat Assiniboine to Fort Union, North Dakota then on keelboat to Fort McKenzie, a site about seven miles downstream from present-day Fort Benton. Prince Maximilian was fascinated by Native American culture, and he, Bodmer, and their entourage spent more than a month in the area. After a large force of Assiniboine and Cree attacked the fort, Maximilian and his group decided to return east, wintering at Fort Clark, North Dakota. In May 1834, the party arrived in St. Louis, and then traveled on to New York City and finally back to Europe. Bodmer created 81 paintings to illustrate the journey in the American West. His work captures images of many native peoples, including their apparel, cultural ceremonies, and material possessions. Bodmer’s other significant paintings included breath-taking landscapes, such as the sculpted rock formations of the White Cliffs and Citadel Rock that sit along the Missouri River. Much of the landscape he captured still looks the same today as when he and Prince Maximilian traveled through.